Inflammatory bowel disease (IBD) is a group of inflammatory conditions of the colon and small intestine, comprised of ulcerative colitis and Crohn’s disease. Among the complicated pathogenic factors of IBD, the overaction of inflammatory and immune reaction serves as an important factor. Inflammasome is a form of innate immunity as well as inflammation. Among all kinds of inflammasomes, the NOD-like receptor family, pyrin domain-containing 3 (NLRP3) inflammasome is the most studied one, and has been revealed to be involved in the pathogenesis and progression of IBD. Here, in this review, the association between the NLRP3 inflammasome and IBD will be discussed. Furthermore, several NLRP3 inflammasome inhibitors which have been demonstrated to be effective in the alleviation of IBD will be described in this review. Bo-Zong Shao, Shu-Ling Wang, Peng Pan and Jun Yao contributed equally to this work. Dr. Yu Bai was supported by the National Key R&D Program of China (2017YFC1308800, 2018YFC1313103), National Natural Science Foundation of China (Grant Nos. 81670473 and 81873546), and Three Engineering Training Funds in Shenzhen (No. SYLY201718). Dr. Jun Yao was supported by the National Natural Science Foundation of China (Grant No. 81800489), Three engineering training funds in Shenzhen (No. SYLY201718), and Technical Research and Development Project of Shenzhen (No. JCYJ20150403101028164 and JCYJ20170307100538697). B-ZS, S-LW, and PP retrieved and analyzed concerned literatures. B-ZS and JY wrote the manuscript. S-LW and PP designed the table and figure. E-QL, YB, and Z-SL revised the manuscript. All the authors agreed to be accountable for the content of the work. Ziade, F., C. Rungoe, T. Kallemose, A. Paerregaard, A.V. Wewer, and C. Jakobsen. 2018. Biochemical markers, genotype, and inflammation in pediatric inflammatory bowel disease: a Danish population-based study. Dig Dis: 1–7. https://doi.org/10.1159/000494215. Wang, R., L. Wang, Y. Luo, D. Wang, R. Du, J. Du, and Y. Wang. 2018. Maggot protein ameliorates dextran sulfate sodium-induced ulcerative colitis in mice. Bioscience Reports. https://doi.org/10.1042/BSR20181799. Hayward, J.A., A. Mathur, C. Ngo, and S.M. Man. 2018. Cytosolic recognition of microbes and pathogens: inflammasomes in action. Microbiology and Molecular Biology Reviews 82 (4). https://doi.org/10.1128/MMBR.00015-18. Henderson, J., S. Bhattacharyya, J. Varga, and S. O'Reilly. 2018. 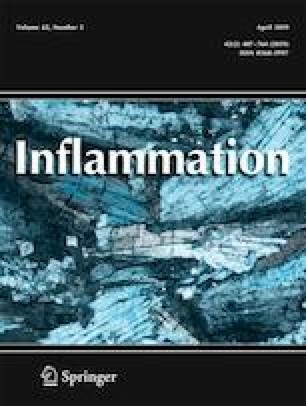 Targeting TLRs and the inflammasome in systemic sclerosis. Pharmacology & Therapeutics. https://doi.org/10.1016/j.pharmthera.2018.08.003. Chung, I.C., C.N. OuYang, S.N. Yuan, H.C. Lin, K.Y. Huang, P.S. Wu, C.Y. Liu, et al. 2019. Pretreatment with a heat-killed probiotic modulates the NLRP3 inflammasome and attenuates colitis-associated colorectal cancer in mice. Nutrients 11 (3). https://doi.org/10.3390/nu11030516. Shirasuna, K., T. Karasawa, and M. Takahashi. 2018. Exogenous nanoparticles and endogenous crystalline molecules as danger signals for the NLRP3 inflammasomes. Journal of Cellular Physiology. https://doi.org/10.1002/jcp.27475. Latz, E., and P. Duewell. 2018. NLRP3 inflammasome activation in inflammaging. Seminars in Immunology. https://doi.org/10.1016/j.smim.2018.09.001. Jairath, V., J. Jeyarajah, G. Zou, C.E. Parker, A. Olson, R. Khanna, G.R. D'Haens, W.J. Sandborn, and B.G. Feagan. 2018. A composite disease activity index for early drug development in ulcerative colitis: development and validation of the UC-100 score. The Lancet Gastroenterology & Hepatology. https://doi.org/10.1016/S2468-1253(18)30306-6. Carbonnel, F. 2018. Towards more efficient assessment of ulcerative colitis drugs. The Lancet Gastroenterology & Hepatology. https://doi.org/10.1016/S2468-1253(18)30342-X. Zhang, Z., S. Li, H. Cao, P. Shen, J. Liu, Y. Fu, Y. Cao, and N. Zhang. 2019. The protective role of phloretin against dextran sulfate sodium-induced ulcerative colitis in mice. Food & Function. https://doi.org/10.1039/c8fo01699b. Grammatikopoulou, M.G., K. Gkiouras, X. Theodoridis, E. Asteriou, A. Forbes, and D.P. Bogdanos. 2018. Oral adjuvant curcumin therapy for attaining clinical remission in ulcerative colitis: a systematic review and meta-analysis of randomized controlled trials. Nutrients 10 (11). https://doi.org/10.3390/nu10111737. Wang, Y., Q. Tang, P. Duan, and L. Yang. 2018. Curcumin as a therapeutic agent for blocking NF-kappaB activation in ulcerative colitis. Immunopharmacology and Immunotoxicology: 1–7. https://doi.org/10.1080/08923973.2018.1469145. Huo, X., D. Liu, L. Gao, L. Li, and L. Cao. 2016. Flavonoids extracted from licorice prevents colitis-associated carcinogenesis in AOM/DSS mouse model. International Journal of Molecular Sciences 17 (9). https://doi.org/10.3390/ijms17091343. Mathai, B.J., A.H. Meijer, and A. Simonsen. 2017. Studying autophagy in zebrafish. Cells 6 (3). https://doi.org/10.3390/cells6030021. Zheng, X., M. Hu, X. Zang, Q. Fan, Y. Liu, Y. Che, X. Guan, Y. Hou, G. Wang, and H. Hao. 2019. Kynurenic acid/GPR35 axis restricts NLRP3 inflammasome activation and exacerbates colitis in mice with social stress. Brain, Behavior, and Immunity. https://doi.org/10.1016/j.bbi.2019.02.009. Improta Caria, A.C., C.K.V. Nonaka, C.S. Pereira, M.B.P. Soares, S.G. Macambira, and B.S.F. Souza. 2018. Exercise training-induced changes in microRNAs: beneficial regulatory effects in hypertension, type 2 diabetes, and obesity. International Journal of Molecular Sciences 19 (11). https://doi.org/10.3390/ijms19113608.